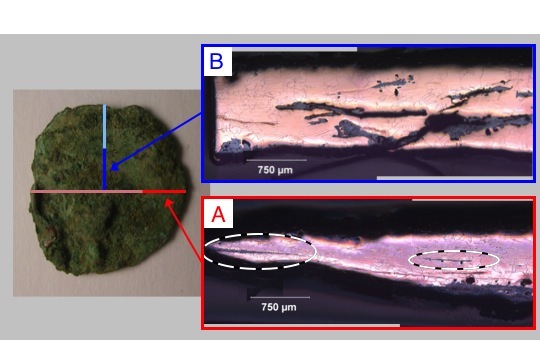 Copper artifacts from Cahokia Mounds, Illinois were analyzed from a materials science perspective to shed light on techniques used by Mississippian copper workers to deform nuggets of native copper into thin sheets. Eight small copper pieces from a copper-working site at Cahokia's Mound 34 were subjected to metallographic examination. Replication experiments then recreated features of the artifacts under controlled conditions. It is concluded that copper sheets were likely thinned through repeated cycles of hammering and annealing performed at temperatures achievable in an open wood fire. The welding of sheets to create multilayered objects was not observed in any artifacts and could not be accomplished experimentally. Additionally, a possible cutting method used on some artifacts was identified. 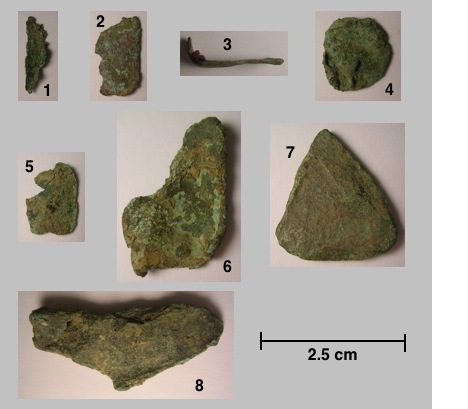 Figure 1: Images of the 8 copper artifacts recovered at Mound 34 in Cahokia, Illinois. The variety of thicknesses, shapes and sizes suggests that these pieces of copper sheet were abandoned at different levels work. Figure 2: Optical micrograph of cross-section from artifact 4: (A) showing planar oxide inclusions (circled) that appeared to suggest layering. (B) taken from a perpendicular cut on the same artifact, containing disordered oxide inclusions, likely indicative of flattened surface protrusions rather than intentional layering. Chastain, M. L., Deymier-Black, A. C., Kelly, J. E., Brown, J. A., & Dunand, D. C. (2011). Metallurgical analysis of copper artifacts from Cahokia. Journal of Archaeological Science, 38(7), 1727-1736. This research is funded through a collaboration with Washington University, St Louis, MO and funding from National Geographic.